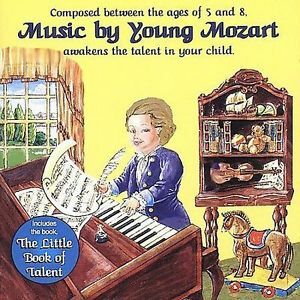 This is a "one of a kind recording" of Mozart's music, composed when he was 5-8 years old. A kid-friendly recording played on guitars by The Bremen Town Musicians. Amazingly, these are fully mature compositions and not those of a student or beginner. This incredible music for kids by a kid, inspires children to discover and develop their own talents. The included book "The Little Book Of Talents" tells how to do it. When kids hear the music composed by Mozart when he was their age, it makes them interested in discovering and developing their own talents. The enclosed book, The Little Book of Talent shows parents how to discover and develop the talent in their child. Finding ones talent and developing it is one of the most important paths to happiness and prosperity in life. The book shows how, and the music inspires kids to want to find their talent.